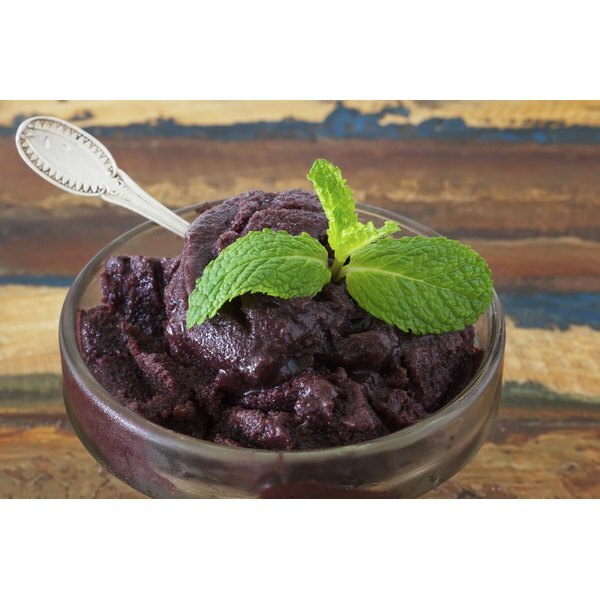 A popular Brazilian desert made with acai berry pulp. 4 Can Tri-Luma Be Used to Fade Acne Scars? The berries of the acai palm tree are often used in making medicinal treatments, says Medicinal Herb Info. They grow near the of 60-foot trees that are native to the rainforests in Brazil. Before you begin to use acai berries to treat your acne, discuss it with your health care provider. MayoClinic.com describes acne as slow-healing lesions on the skin that are possibly affected by the body’s hormones. The blemishes are caused by factors including the overproduction of oil, a buildup of bacteria and irritation of the hair follicles of the skin, which become plugged with oil and dead skin cells. These clogged follicles can become pimples, which are raised, red spots, whiteheads or blackheads. People can get acne at any age. If not treated properly, acne can cause permanent scarring of the skin. The site says that the earlier and more effective the treatment, the greater the possibility of the condition worsening. Acai is often used to treat allergies, autoimmune disorders, diarrhea, heart disease and cancer, says the Memorial Sloan-Kettering Cancer Center or MSKCC website. Drugs.com reports that acai is a powerful antioxidant that has anti-inflammatory properties as well, making it a promising treatment for these conditions as more is learned about the acai berry. Its anti-inflammatory properties may prove helpful in treating acne when applied to the skin as an ingredient in skin care products. A recent article on the PubMed.gov website describes research on the most effective natural ingredients in skin care products. Among those that showed the most promise for treating skin conditions was acai. The acai extract, added to skin care products, is promising for treatment of acne, rosacea and skin discoloration. If you can't find skin care products containing acai, you can add it yourself. According to the MSKCC site, acai berries have no real substantiated side effects. However, the site warns that people on chemotherapy should discuss taking acai with their pharmacist or health care provider because it may interfere with the actions of their cancer medications. MayoClinic.com says acai berries are available at many gourmet or health food stores. They can be eaten raw, or the juice can be made into smoothies, energy drinks, ice cream, jelly or consumed in refreshing juice form. Drugs.com adds that acai supplements are available in capsule, tablet and extract forms. Mayo Clinic: Acai berry products: Do they have health benefits? PubMed.gov: Innovations in natural ingredients and their use in skin care. Is Rooibos Tea Good for Acne?